Russian President Vladimir Putin spoke out against excluding foreign companies from the Russian government procurement program, saying the local market shouldn’t be deprived of competition. "Should we wholly exclude foreigners, taking advantage of the situation kindly provided to us by our partners and competitors? We should be careful here. Maybe we are able to do that, but do we need to completely deprive the domestic market of foreign competition? 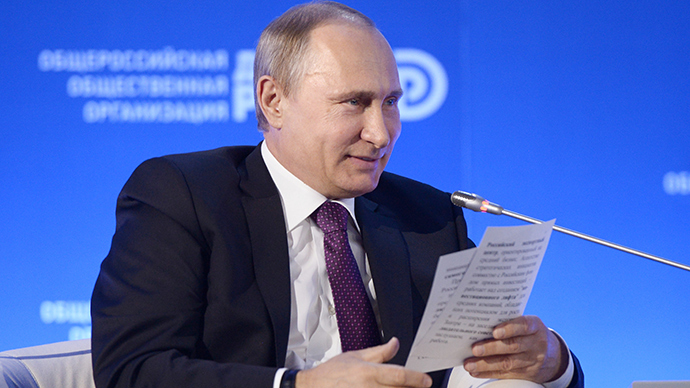 Probably not," said Putin at the 10th annual Business Russia forum in Moscow Tuesday. "It’s a dangerous thing to do”, he added. Turning his attention to small and medium businesses, the president said they should be on a level playing field with government-run companies. He also stressed that they should strive for quality, as it is very important to consumers. For example, the Ford Motor Company became so good not only because it perfected assembly-line production, but also combined price and quality of the goods, catering to the masses. This is a golden rule of business not to be forgotten, Putin said. It is important for businesses to build their own research agencies that can scout and bring new technology to Russia, tapping the positive experience of foreign companies, said Putin. He advocates the creation of domestic research and development centers. “We should not limit ourselves to localizing car manufacturing and putting paint on cars and detailing them, though that’s also a high-tech process. We have to design the technology,” said Putin. Russia has been pursuing import substitution policy since last year, when anti-Russian economic sanctions were introduced by the US and its allies. As a counter-measure, Russia introduced a food embargo against countries that supported sanctions. Both Russia and the West have admitted that the so-called ‘sanctions war’ was a dead-end policy, disadvantageous to the both parties.